Mercury is a potent neurotoxin present in our daily lives and our body can accumulate it over the years. Food consumption, such as fish and rice, is the most common source of mercury exposure. Mercury can be found in dental amalgams, compact fluorescence lamps, vaccines, drugs, and electronics or can be used in artisanal gold mining. Finding the source of mercury contamination in our bodies is crucial for treatment and forensic investigations, but at present knowledge of the molecular form of mercury in human tissues and fluids, which could indicate source, is limited. However, an international team from the CNRS, the Universities of Grenoble Alpes and Bordeaux, France, the ESRF, the European synchrotron in Grenoble, France and the University of Illinois at Chicago, US, has developed new analytical capabilities that allow the identification of chemical forms of mercury in human hair that trace exposure. These results are published in Environmental Science & Technology. Mercury is considered by the World Health Organisation (WHO) as one of the top ten chemicals or groups of chemicals of major public health concern. Exposure to mercury — even small amounts — may cause serious health problems in the nervous, digestive and immune systems, and is particularly dangerous for very young children and development of the child in utero. Identifying the type of mercury contamination, the dose, and the period and duration of exposure could provide key indicators to treat mercury poisoning. Until today, depending on the suspected source of contamination, mercury intake has been monitored by measurement of mercury concentration in urine, blood, or scalp hair. These measurements help to diagnose the dose of poisoning and provide data for epidemiological studies, but provide incomplete information on the source of mercury exposure essential for treatment and forensic investigations. 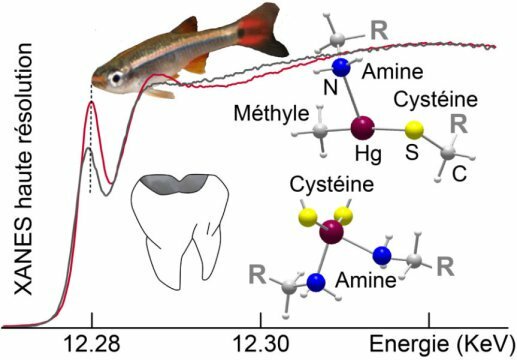 "Although urinary mercury concentration is considered to be the most accurate and widely used biomarker for assessing chronic exposure to mercury vapour and divalent mercury, we showed that inorganic mercury from dental amalgams can be detected in hair with distinct intermolecular structure from that of methylmercury from fish consumption" says Jean-Paul Bourdineaud, Professor of environmental toxicology at the University of Bordeaux, France. "Epidemiological studies on mercury intake through fish consumption assume that hair concentration is an indicator of only this source. Our results show that this assumption may not always be true" says Kathryn Nagy, Professor of Earth and Environmental Sciences at the University of Illinois at Chicago. With an average growth rate of about 1 cm per month, hair can capture contamination events with high time resolution. The team of researchers developed new analytical capabilities that allowed them to identify chemical forms of mercury in human hair. Using new synchrotron instrumentation, they found that mercury can be linked to source of exposure by precise characterisation of its bonding environment. Experiments at the ESRF have shown, for example, that a mercury spike along a hair strand was correlated, in this particular case, with a specific unsafe removal of dental amalgam. The data provide signatures of mercury sources, distinguish exogenous vs. endogenous exposure to inorganic mercury, and indicate the timing to within 1 or 2 days of an exposure event. As straightforward as it may seem, the team had to deal with some technical challenges before managing to retrieve this information: structural characterisation is complicated by the low concentration of mercury typical of most of the general population's hair (typically 0.1 to 3 ng of mercury/mg hair), and the flexibility of the mercury bonding environment which exhibits diverse coordination arrangements with carbon, nitrogen, oxygen, and sulfur atoms. "When we realized that the microscopic 2.5 ng mercury hot-spot had a specific molecular signature, we were amazed. Still, to preclude any ambiguity on its origin, we had to determine the form of mercury and how it was chemically bonded to the hair proteins. This took several months of intense data analysis and calculations" says Alain Manceau, Director of Research at the CNRS. To address these challenges, the team used the high performance capabilities of the ESRF by exploiting the X-ray nanoprobe experimental station at ID16B, an ESRF nano-analysis beamline, and by constructing a high-luminosity X-ray crystal multi-analyser that fully takes advantage of the high-brilliance of the ESRF ID26 spectrometer beamline. As explained by Remi Tucoulou, scientist at ID16B, and Pieter Glatzel, scientist at ID26: "Such measurements on samples with very low metal concentrations require instruments that are extremely sensitive and at the same time provide very high resolution for chemical characterisation." The above post is reprinted from materials provided by CNRS (Délégation Paris Michel-Ange). Note: Content may be edited for style and length. When we're unsure how to respond, how does our brain decide whether a situation is pleasant or not?